Want to hide your waterfall box? 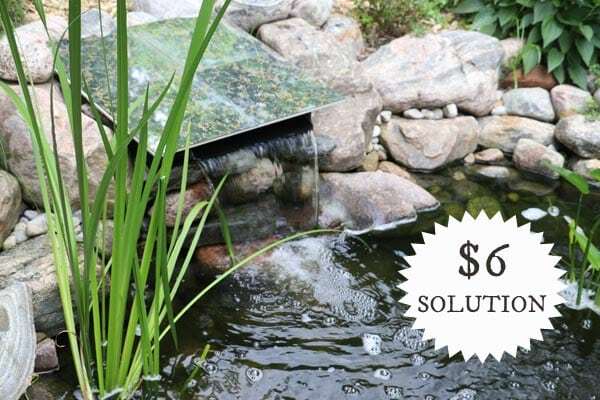 This is an inexpensive and convenient way to disguise a pond spillway while still being able to easily access it for cleaning and maintenance. The materials cost a total of $6 from the local thrift shop. 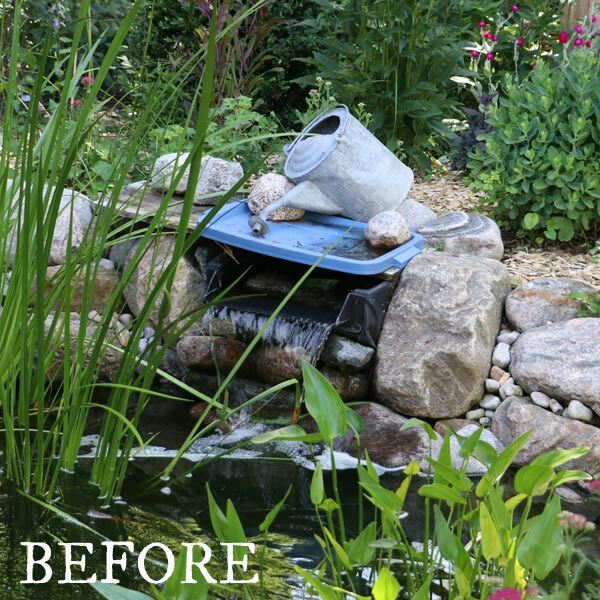 If you would like to see how I built my garden pond all by myself, I have detailed here: How to Build a Backyard Garden Pond. 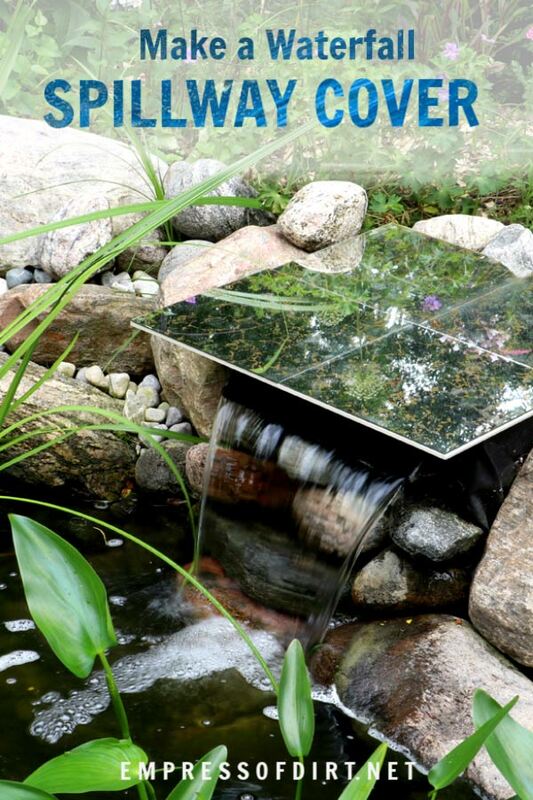 Waterfall spillways (see one here on Amazon) provide a few functions for garden ponds. These molded tubs have an opening for the input hose, bringing water from the pond pump, and then dumping it back into the pond via the waterfall. And round and round it goes.. The body of the tub holds filter sponges (to collect gunk from the pond) and bio-balls (see them here on Amazon), which are another way to filter water. 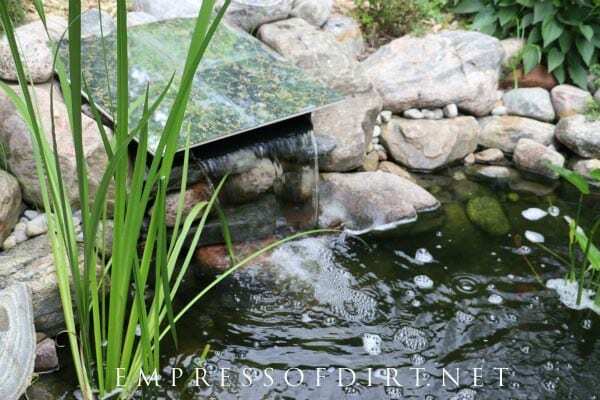 The problem is, whatever covers a spillway needs to be easy to remove because it’s a key maintenance area for a pond, so it needs to be something lightweight but durable for the outdoors. 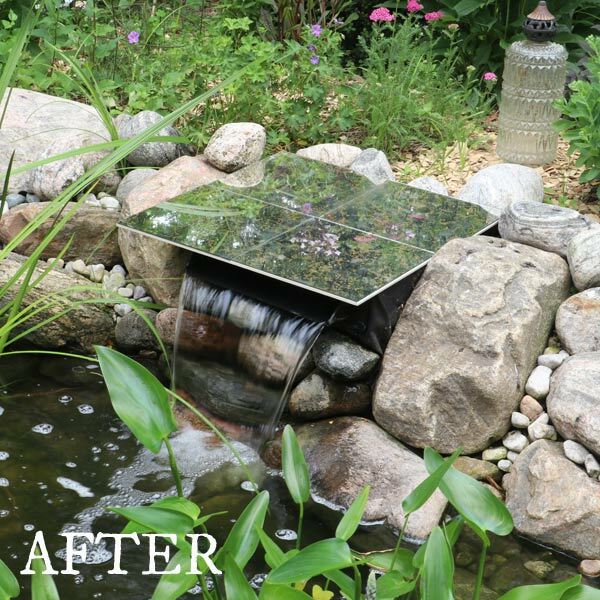 After building my pond, I was looking for options to create some sort of easy-to-remove cover for my waterfall. The product that pond companies sell is a fake rock like this one. You can place them across a spillway or on top of a skimmer box. They look okay in the photos but the price is a bit startling. Depending on the size, fake rocks can range in price from $60 to over $200. Crikey. As a temporary solution, that went on far too long, I put a wooden board across the top and sat some rocks on it (above). It looked pretty good but it was a bit cumbersome removing everything to clean the filters. Finally, I scoured a local thrift shop that sells old building materials and found a good solution. The mirrored tiles are leftovers from that epic era in the 1970s and 80s when you could decorate your rec room walls with these lightweight beauties. Not wanting to cut the tiles or the mirrors, I simply glued the mirrored tiles to the floor tile using GE Silicone II adhesive. Any good waterproof, outdoor adhesive will do. 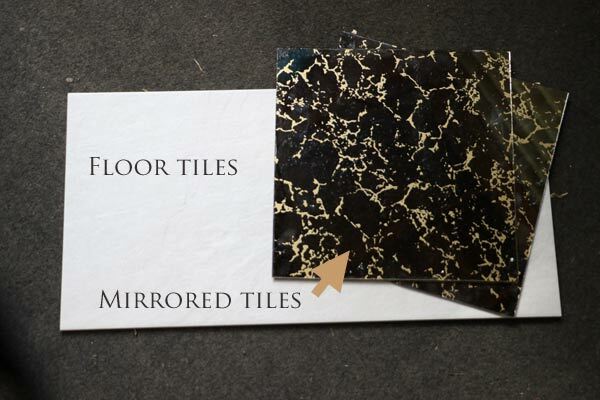 SAFETY TIP: Be sure to choose mirrored tiles that are really dark and do no reflect much light at all. I’m super cautious when using mirrors in the garden. 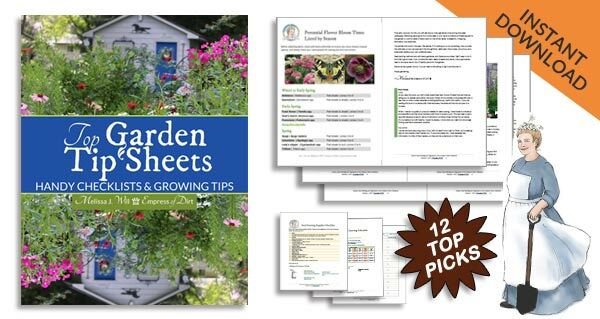 You can read more tips here: How to Safely and Creatively Use Mirrors in the Garden. My first choice is ceramic tiles with some sort of lovely design on them. I’m on the hunt! I placed the two sections over the spillway and—ta-da!—it’s snug in place. It’s heavy enough that it does not move, but super easy to remove. I wasn’t sure what I’d think but once it was in place, I really love it. It’s quite sleek and mod looking and really fits my garden style. Now, to access the spillway, I just remove the two tiles and that’s it. Much easier and an excellent solution for just 6 bucks. 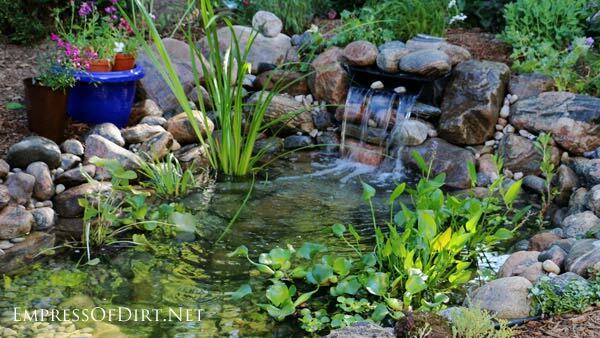 Advice for Starting A New Garden Pond | Good advice for getting started. DIY Build a Garden Pond in a Raised Bed | Excellent option when you don’t want to dig!